I hope fellow bloggers will Follow me with this idea - it's our journey to the allotment, taking in a few local sights on the way. What's your journey like? We walked up yesterday morning when Hungerford was reasonably bright, though rather chilly. Across the road by The Bear Hotel. There used to be stuffed bear, with its cub, in the entrance hall :-( I'm so glad times have changed! Past the war memorial which the River Dun passes by on either side. A little further towards the High Street and over the Kennet & Avon Canal, with the Rose of Hungerford moored and waiting to take visitors on a trip to Kintbury. On up the High Street, with the Corn Exchange clock beyond the railway bridge. Then we take an alleyway to the Croft, with the 'drunken posts' which were erected in 1863. The Croft is a nice spot with the avenue of trees past the tennis club, bowls club and the Hungerford Club. Past St Lawrence's Church, which was built in 1816. Looking through the churchyard, to the canal boats in the distance. 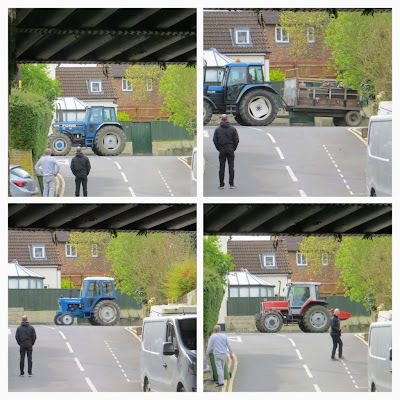 A little incline under the railway bridge and yesterday there happened to be some sort of parade of about eight tractors - not sure what that was about, but it caused some amusement as each one trundled past. Under the clematis which is making its way across the road via the telephone wires! ...with bluebells and primroses at the moment. Further along we reach the Shalbourne Brook, locally known as the Shalbourne Leak. It's a lovely babbling brook which leaks into the canal. And here we are at the allotment site! I hope you liked that little walk. Our alternate route is across Freeman's Marsh, which is a lovely area for cattle and wildlife, but takes a bit longer. I chose Genesis for the song title - now over to you!